Recently we had the good fortune to spend a bit of time in the city of Philadelphia. We took a few hours to go and check out the Race Street Pier, the new waterfront pier designed by Field Operations. The Pier had been open for about a year, and it seemed like a good chance to take in the place now that the new car smell has dissipated. For us, it was a chance to take in a project by the firm that has dominated east coast and national perception about landscape design since the opening of the first phase of the High Line (and which has been the object of much of our impotent fury, mostly because we begrudgingly respect them so much). Like the High Line, Race Street Pier benefits from an evidently healthy capital budget (6 million) and an absolutely stunning historical and physical context- it is a former industrial workhorse jutting out into the Delaware River with the Benjamin Franklin Bridge framing views beyond. The Pier splits in two levels, using a series of ramps and wrapping terraces to dramatize the vista out over the Delaware from the end of the pier. This is fantastic- a thoughtful concept and well executed. The proportions of the low zone, the high zone, and ramp and stairs that connect them seem nicely done. This is a specific type of connection to the water- you remain physically separated (not a bad thing given the nastiness) and yet your are enthralled by the way it presents itself to you at the edge of the Pier. The Delaware pulls you from the street through the pier to the edge, and once there you have many options, intelligently woven together, to negotiate your relationship to the River itself. Given this, it seems odd that the design does not relate in any way to another working pier literally a stone’s throw from the Race Street Pier. I’m talking of course about the pier ramp for the duckboat tours where tourists and school kids ride around the city in a ridiculous-looking amphibious vehicle and honking on kazoos in the shape of a duck’s bill. This comes right down Race Street drives down the ramp and splashes in to the filthy water of the majestic Delaware. But the Race Street Pier doesn’t deal with this, except to block any direct view of it from near the street with plantings. I know the entertainment of a duck boat is crass and maybe you don’t want to set the ramp-pier up as the object of fascination when you have the Ben Franklin Bridge and the Delaware River right there, but when you are out there it does seem that the two should relate through materials, scale of water relations, or proportions, or otherwise. The plantings are lush and beautiful. And ambitious. Large trees are planted in recessed containers, and some will not be happy in a few years. But this is a small price to pay for the textures, color, shade, and habitat the plantings bring. It is unclear who worked with Field Operations on the planting design, perhaps they took copious notes from Piet Oudulf while working on the High Line, but they are varied and beautiful, and seem to be leafing out quite nicely after their first winter on the waterfront. The great objects of this landscape- the bridge, the skyline, the river- are rightly revered. The humble objects are shat upon. The duck boat ramp-pier has its charms. The familiar concrete and guardrail highway materials plunging in to the Delaware River in the hopes of entertaining kids and tourists begs for the Race Street Pier to come out and play. To no avail. It should be noted that almost the entire Pier is decked in Trex. Why? Why, WHy, WHY??? This is horrible. I suppose it will limit splinters, and we all know that it is a “recycled synthetic material”, which likely has some currency given the sustainability conversation taking place. But Trex as it is currently manufactured and used gives synthetic materials a terrible name. If it is going to be the material of choice here, could we not vary the proportion, the color, or at least do away with the insulting wood-grain stamp? It’s tough to blame a corporation like Trex Company for the lack of courage in exploring the potentials inherent to the synthetic manufacturing process- their mandate is to make money, and they are conservatively doing that by meeting the known desires of the market. But the landscape designer should be more daring. If you have decided to use Trex, or some other synthetic lumber materials, and you want a stamped pattern to add texture, at least use some imagination and don’t default to the wood grain. Wood grain exists in real wood for a real reason, not because it’s trying to look like wood. Next time, please attempt adapt the famous Portuguese “mar largo” (open sea) pattern to the scale of the Delaware, or use polka dots, or simply “put a bird on it”. But don’t stamp it with wood grain. The plaques located at the base of each of the quercus bicolor trees are an affront to thoughtful detailers everywhere. This is always a tough position for a designer. These were obviously a last-minute addition, probably required when a funding opportunity was discovered by the client who then put upon Field Operations to find a spot for something to carry names that could be associated with a park object. And it shows. The framing of the tree pits is poorly done in general; whether this is through bad detailing or shoddy carpentry is not clear. But those plaques! The dimension chosen for them was obviously intended to match that of the trex lumber, and yet the detail drawn for them did not account for the vertical edging that frames the tree pit. What results is a pitiful looking offset metal plaque left sitting above the rest of the decking, in lieu of a simple metal plate inset in to the decking, nicely aligned, flush, and well constructed. The handrails and guardrails also deserve attention. These create one of the most striking effects of the pier thanks to the 20-degree cant of the rails. These must have been extremely expensive- thin, deep metal posts holding metal bars and topped with a wide wood leaning rail. Unfortunately, as you can see here, the lengths of the two different materials- the wood leaning rail and the metal fencing and posts- were not coordinated, and so you end up with extra joints, some in very odd places (like 1’ from the end of the fence). The flange where the posts attach is not offensive, but is thoughtless, and this detail unfortunately repeats throughout the pier when furniture and structures meet decking. When the guardrails are used to support a handrail along the steps at the end of the pier the result is catastrophic. 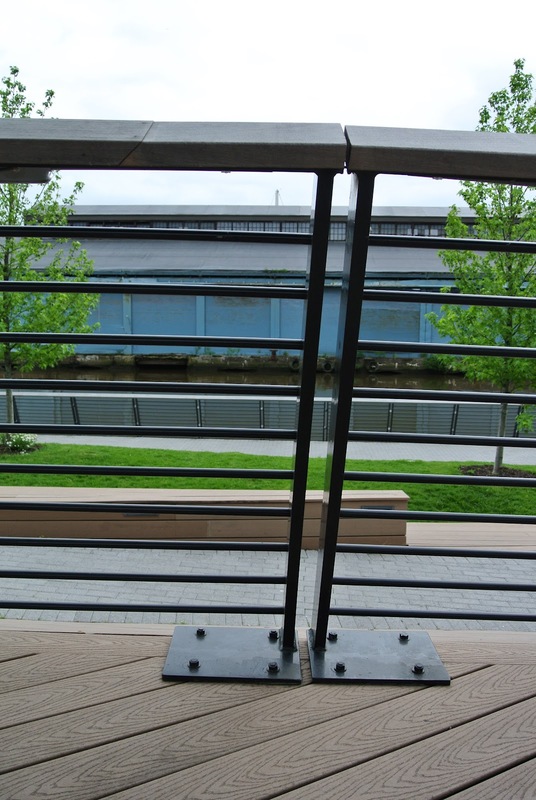 Bits of metal are welded willy-nilly, heights of hand rails are not aligned with nor contrasted against the form and elevation of the stepped seating. The effect is something like a pimply-faced teenage boy asking his middle school crush to dance in the middle school gym. Equally massive doses of arousal and embarrassment mix powerfully together to create a potent mix of shame. Shame sandwiches for everyone, and a glass of shame punch. This brings us to the most unfortunate detail of the whole bunch. It’s the most egregious because it actively works to undo the most daring and thoughtful of the conceptual moves in the design- the dramatization of the river vista. The placement of a freestanding leaning rail and a bench at the end of the elevated portion of the pier is bizarre. If you want to go lean on the rail, then you are putting your pleated khakis right in someone’s face, and if you prefer to sit down then the leaning rail is nicely positioned to obscure your view out over the river. There are many things one could say about this confused spot, but I think the ineptitude is self-evident. Let’s pray they take the leaning rail out one day and just move on. The array of details working to execute this composition are well done. Moving from right to left, it’s not clear why the Trex boards do not continue the angle of the railing, but the decision to angle them is visually appealing and beckons to cyclists and toddlers (that’s a good thing). The material shift for the ramp is plain and simple and successfully allows for the topographic alignment of the terrace landings with segments of the ramp (this wouldn’t have worked with a more linear surface element). Lastly, the gently raised grass berm allows for more growing medium for the trees and articulates zones of use without separating them significanctly. A lot of good things are happening here. Solid, simple moves reinforcing a couple of more daring choices. The landscape design for Race Street Pier builds on the spectacular site situation, makes some powerful conceptual moves (elevating and splitting the procession toward the water, verdant planting beds contrasting the concrete-and-steel aesthetic of the surroundings) and misses a few opportunities (no relation to the slab of concrete-and-guardrail that lets cars loaded with kids and tourists drive right in to the Delaware River; a furthering of their concept- a simple section of the pier that dips toward the water on the side of the duckboat ramp- would have done it). However, the detailing could have benefited from an afternoon with old friends at DSR. What is evident is the prioritization of concept over execution, planning over building. It is the materialization of an ethos and pedagogy that has been cultivated to great effect during the last 20 years at UPenn. The quality of the design work is high despite several bad details and material choices. And this only makes me more desperate to see evidence of a realization of the possibilities that exists in the space between concept and form. But in seriousness, great review of the Race Street Pier. It sounds like it is still a net positive for the city, despite its flaws. I totally agree. Not only a net positive, but a big one, despite the flaws. Bits may or may not hold up that well, but they may be rebuilt better. I think people could argue that the fact that it is part of a larger gentrification project, to parkify the waterfront. In fact, I often do. But in the context of Philadelphia it seems there is definitely some space for a little gentrification, and there are some very nice moves taking place here in my opinion. perhaps trex was used bc it wears better than wood? Its capacity to resist salt, and constant wetness?